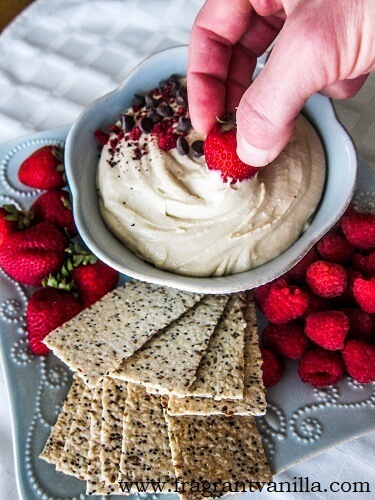 I love hummus of any sort, and I am always trying to come up with new and interesting flavors. I love the classic hummus with tahini, lemon, and lots of garlic and cumin of course, and I can get that kind in the deli I work in because ours is really good. But when I am at home, I like to experiment. Especially with dessert hummus. 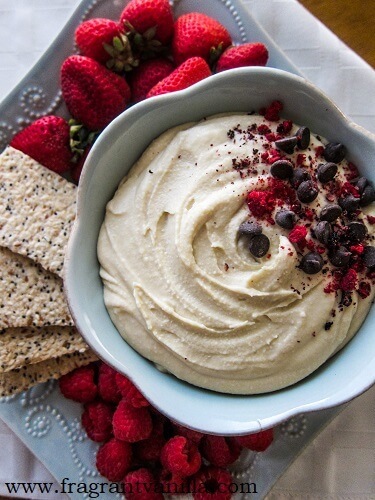 If you haven't heard about the latest trend in the last year of dessert hummus, and think it sounds weird, trust me it is amazing stuff. I mean, you get to enjoy dessert and a protein and fiber rich snack at the same time! Which is why I love it. I like my desserts to have nutritional benefits sometimes and this is perfect for that. I have made many different kinds, including chocolate cake batter, red velvet cake batter, mint chip, strawberry, pumpkin pie and salted caramel and they were all delicious. I realized however I was missing cheesecake dessert hummus. How could I miss my favorite dessert for a hummus flavor inspiration? 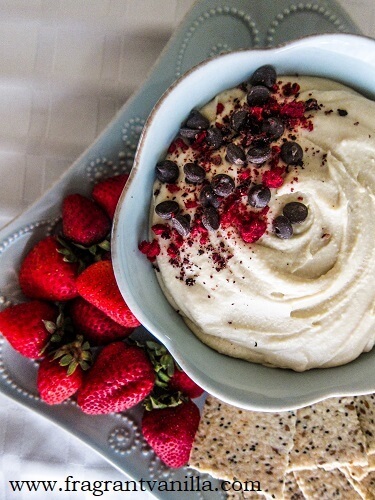 So a few days back I decided to make some cheesecake dessert hummus. You may think that chickpeas in something cheesecake flavored sounds odd, but I actually use chickpeas in some of my nut free cheesecake fillings. They are neutral and they blend in well. So I knew they would be perfect in this hummus! 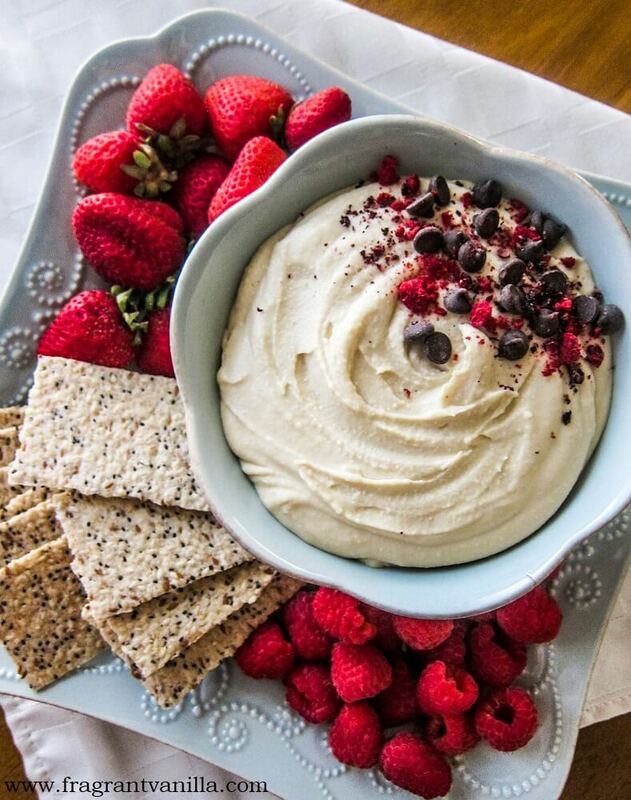 They composed the bulk of it, but I also added coconut milk instead of water to make it creamy, as well as cashew butter in place of the tahini in traditional hummus. I sweetened it with a bit of maple syrup and added a touch of vanilla and it smelled amazing. Lastly to give it the tang of cheese I added some lemon juice and of course sea salt. I buzzed it up in the vitamix until it was nice and smooth and I could not wait to try it out! It was so good! 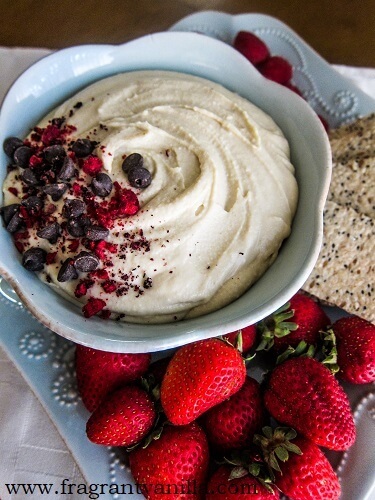 I enjoyed it with some berries, and it was like eating cheesecake, only soft enough cheesecake to dip things into. You can't go wrong with that. There are so many things you could pair it with. Chocolate, graham crackers, cookies, different types of fruit etc. If you are a big cheesecake fan or an adventurous hummus flavors person you should definitely give this a try! Could I use something in place of nut butter? I’m allergic. Sneaky chef no nut butter possibly? You could leave it out, or add tahini instead if you still want the richness. Is the coconut milk canned or Coconut (plant-based milk) ? Thank you. For this recipe I used the canned, but you could use either.